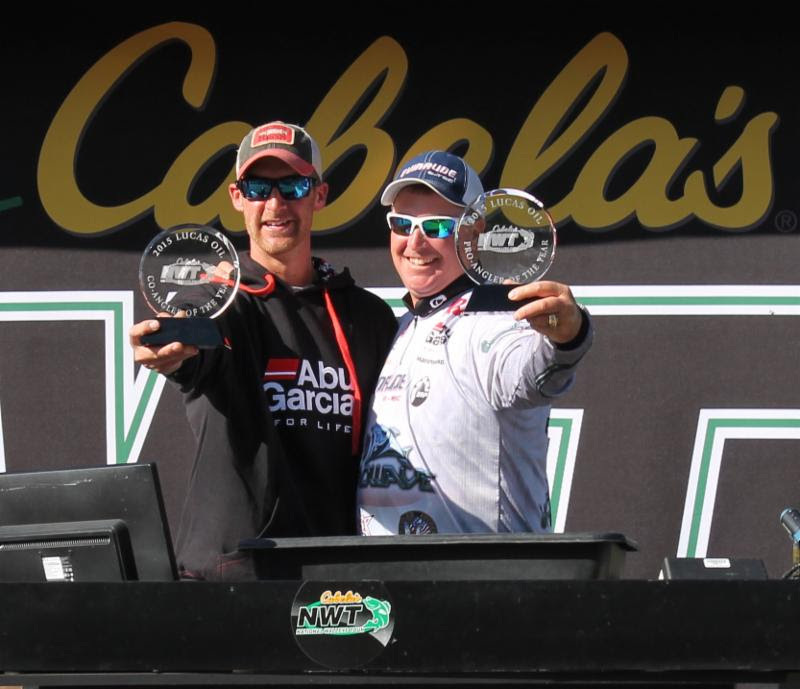 NEW SMYRNA BEACH, Fla. (September 22, 2015) – After the dust settled on the Cabela’s National Walleye Tour (NWT) championship event at Devils Lake, North Dakota, pro-angler Mark Courts and co-angler John Hoyer emerged as the Lucas Oil Angler of the Year Award (AOY) winners. Along with custom Lucas Oil AOY rings, both anglers earned paid entry fees for the 2016 NWT season. Courts has chased an AOY title for his 16 years of professional competition. After a number of tournament wins and close finishes in other AOY races, Courts can check this one off of his list. Courts made the decision to step up his game and become more aggressive with his decision making and tactics. There were times during the season where Courts made mistakes but he didn’t let the setbacks put him in a losing mindset. Courts competed in all four NWT events and managed to place in the top 25 in each tournament. This consistency was key to topping the AOY leaderboard. John Hoyer finished first in the AOY race for the co-angler category with four straight top-10 finishes. After placing second at Lake City, Hoyer placed high again with third place at Leech Lake. The co-angler finished the regular season at Green Bay with another third-place podium call and placed fifth in the championship at Devils Lake. Hoyer won over $10,000 fishing as a co-angler this season and plans to fish the pro category in 2016. Hoyer also credits his pro partners as an invaluable source of fishing knowledge with the pros always willing to impart a few bits of wisdom. The Cabela’s National Walleye Tour will kick off the 2016 season in April and will include 3 qualifying events and a year-end championship. Dates and locations should be announced soon. For more details, anglers are encouraged to check out the website atwww.nationalwalleyetour.com.